It doesn’t matter if you like red, sparkling, a nice chilled white, or all three – for anyone who takes their wine seriously – a home wine fridge is certainly something to consider. It might seem like an indulgence, but with countertop models on the market for under £100, the optimal bottle is more accessible than you think. We review the best wine fridges at the best prices. Check out all our appliance buyer's guides for more great finds at great prices. It’s worth noting that wine fridges aren’t intended for long-term storage – a specialist wine cabinet or cellar is far more suitable if you’re particularly serious about collecting – but rather for keeping a select few bottles to hand. After budget, the next big thing to consider is your kitchen’s layout. If you have a large kitchen with space to spare, a freestanding full-height wine fridge looks very striking and has a larger capacity than an under-the-counter model, ideal for serious wine-drinkers who like to keep a variety of bottles to hand. Under-counter fridges, meanwhile, often come in slimline designs specifically made to meet space concerns, making them suited to small modern flats and crowded kitchens. Finally, for maximum versatility, you may want to look for a wine fridge with more than one temperature zone, which means you can meet the needs of two or more different types of wine at once using targeted climate control. As with many things, the more zones a fridge features, the higher price it can command, so we’ve included a mix of one- and two-zoned fridges in our buying guide to suit a range of budgets. Everyone wants to enjoy their wine at its very best, and this under-counter cooler from Russell Hobbs allows you to do just that. Certainly one for the wine enthusiast, this sleek fridge has six shelves and an interior light for easier viewing, as well as an LED temperature control allowing you to store your favourite beverages in five to 22 degrees. The dual temperature zones mean you can keep reds and whites in the same cabinet, and with room to store up to 46 bottles, your kitchen will be dinner-party ready. This slim wine cooler is compact and quiet enough to fit into a small kitchen, but stylish enough to be a talking point, should you wish. It has an interior light and elegantly curved glass door, so that you can keep an eye on your collection (and show it off to your guests) and simple touch controls to easily adjust the temperature. A very good buy for kitchens on the small side, and for a reasonable price, too. With the widest range of temperatures on our list, and an incredibly generous 127-bottle capacity, this Fisher & Paykel wine fridge is one for the serious connoisseur. The full-length freestanding design and solid oak shelves make a real statement, and the internal LED lighting and de-misting tempered glass door keep your favourite bottles on show. Above all, this fridge is our best for protecting your investment, with fan-assisted ventilation to minimise musty smells and keep humidity at bay, and UV glass door. This compact countertop wine cooler is the perfect solution for small kitchens that don’t have any under-counter space to spare. It stores eight bottles of wine at temperatures up to 18 degrees in its secure contoured shelves, and is energy- as well as space-efficient, with a rating of A++ that’s very impressive for the price. Overall, it isn’t the most luxurious in terms of looks and construction, but it’s sleek and modern all the same, and an excellent entry-level wine fridge. This CDA fridge is a superbly good buy if you’re looking for an under-counter wine cooler that won’t break the bank. It looks very much more expensive than its middling price point, its robust slide-out wooden shelves and smoked UV-resistant glass an especially pleasant departure from the usual designs, and the two temperature zones are especially impressive for the relatively low cost. For impressive performance in a stylish package, consider this luxurious little fridge, but note that you’ll have to do some rejigging of shelves to fit Champagne and other large bottles. 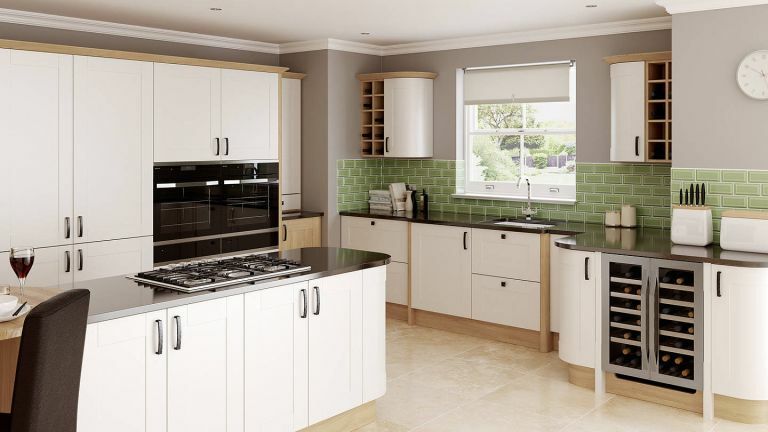 Looking for more kitchen inspiration?